The Red Peg Perego Polaris Outlaw Ride On Vehicle is a terrific children’s ATV by Peg Perego, the leader in children’s battery operated ride on ATVs. 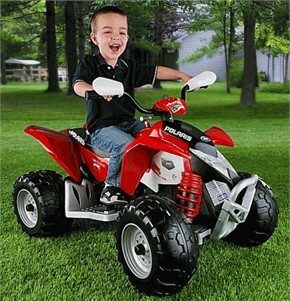 Styled in a powerful red, your 3-7 year old will experience a whole new freedom on this realistic vehicle, styled after real ATVs, and powered by a rechargeable 12-volt battery pack (included). Safety features include high-traction, large knobby, all terrain, high-traction wheels that provide traction on grass, dirt, gravel or pavement, and an easy-to-use accelerator that allows you two speeds of forward motion, and reverse motion, all operated by the same pedal. 2 speeds (2½ or 5 mph) plus reverse (with 2nd gear lockout controls). This innovative design lets you drive, coast, and brake with the same foot, and increases your riding time by 27% per battery charge! Dimensions: 43 3/4" X 271/2" X 26 1/2". Weight capacity: 85 lbs. Made in the USA in our Fort Wayne IN Factory using domestic and global components. Availability: The Red Peg Perego Polaris Outlaw Ride On takes approximately 2 business days to leave the warehouse plus transit time. Please Note: This Item ships ground ONLY and does not ship express or to Alaska, Hawaii, PO Boxes or APO addresses.